Undercabinet lighting works best in the kitchen, where it can be used for task lighting. Undercabinet lighting is exactly as it sounds - it is installed underneath the cabinet, or inside the cabinet to illuminate the contents. The result of undercabinet lighting is a bright focused light. You can also use undercabinet lighting in your bathroom if you have cabinets or cupboards. Why choose LED Undercabinet Lighting? Undercabinet lighting is a popular choice because it provides a bright, focused light which doesn't cast shadows, making it perfect for performing tasks like cooking. There are several reasons why most people opt for LED undercabinet lighting - LED lighting is energy efficient and barely needs to be replaced, making it perfect for installing in awkward-to-reach places such as under cabinets. As practically all of the energy in LED bulbs is converted into light and not heat, they are safe to be used in areas where there are wooden countertops, as they won't damage the woodwork with heat. Installing LED lighting depends on which type of wiring you choose. Plug in fixtures have a power cord, which you can plug into a standard socket and turn on and off as required. If you'd rather control your lighting with a light switch, you'll need lighting which is wired into the wall, or lighting that attaches to a driver which you have to purchase separately. The advantage of plug-in fixtures is that they are perfect for confident DIYers, whereas you'll need to hire a professional for the wired fixtures. At Light Supplier, our selection of undercabinet lighting varies from recessed downlighting which requires a driver, to rechargeable battery lights, which are easier to use. If you need any advice on installation, don't be afraid to contact our friendly customer support team. Round undercabinet lights are sometimes known colloquially as hockey puck lights. They act as a downlight, providing bright, focused light in a downwards direction. You can have these lights recessed into the cabinet themselves, which makes them look neater and less of a distraction. You can even get lights with an infra red sensor, so they will turn on when you open the cabinet door. Strip lighting is another style of undercabinet lighting. The LED is an alternative to fluorescent strip lights, providing a focused light. You might have to install several strip lights to get an even light. LED rope lighting is super thin, which makes it easy to install and very discreet. The lighting isn't as strong as other types of undercabinet lighting, so they make a subtle addition to your kitchen lighting. This comes down to personal preference. It depends whether you would like your undercabinet lighting to create spots of light, or whether a strip that provides a smooth source of light will suit your space more. Strips of light distribute their light more evenly. Surface mounted lighting may sound like it's going to stick out of your cabinets more, but in reality, it doesn't. Recessed lighting goes into the cabinet itself and requires a bit more work, but the end result is that it looks more professional. You can't go wrong with either recessed or surface lighting, again, it's just a matter of personal preference. There are many advantages to choosing LED for your undercabinet lighting. LED lighting generally lasts much longer than halogen lighting, with a lifespan of up to 30,000 hours. This makes LED lighting ideal for installing in hard-to-reach places, as you'll hardly ever need to replace the bulb. LED lighting only uses 5% of its energy on heat, which makes it safer for use under cabinets, as there is no risk of overheating and damaging the wood. You can also opt for a lower wattage LED bulb for the same, or even a stronger, level of lighting. Switching to LED lighting means that you will usually see a reduction in your electricity bill. Under your kitchen cabinets, above the sink, cooker and chopping board, to provide a focused light which doesn't cast any shadows. Inside your kitchen cabinets to help you find items. Use rope lighting under your kitchen island to make it look like it is floating! Undercabinet lighting also works well in your bathroom. Always attach your undercabinet lighting towards the front of the cabinet, to avoid casting shadows. In terms of lumen value, as a general rule, the lighter your countertops are, the less lumen value you need. If you have matte surfaces, you can choose a brighter light as it reflects light more smoothly. 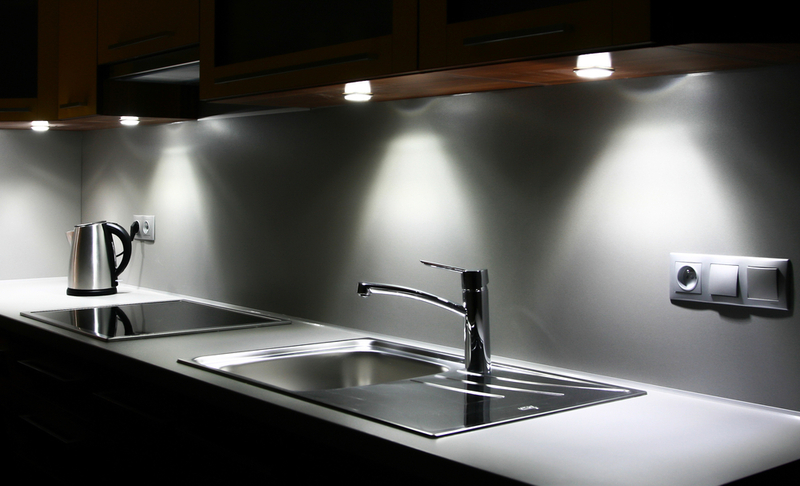 If you have glossy countertops, you will want to reduce glare by choosing lighting with less lumen value.